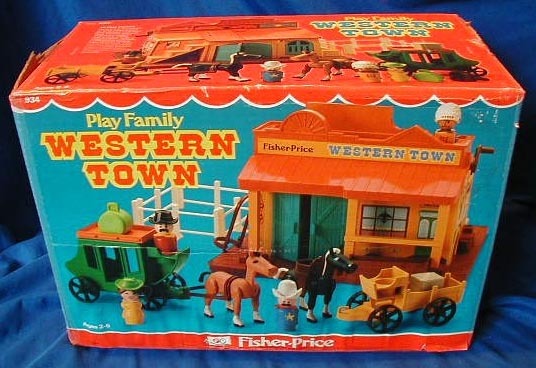 Description: The Western Town, one of the finer crafted 1980's playsets, bears more than passing resemblance to the #937 Sesame Street Clubhouse. 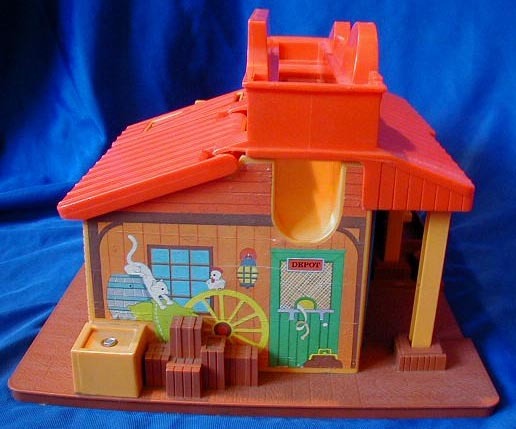 As well it should--the clubhouse base mold was switched around and modified to create the western set. Features that remain intact from the #937 include the walkway mechanism on the roof, the lift-up door flap, and the stairs going up to the second level. Though the box and '82 dealer catalogue features a sherriff with a silver star badge, it's the orange-star version who's much more common. Of course, the rarity of the silver star version has nothing on that of the stagecoach roof, a sure sign of an often lost--and now pricey--accessory. 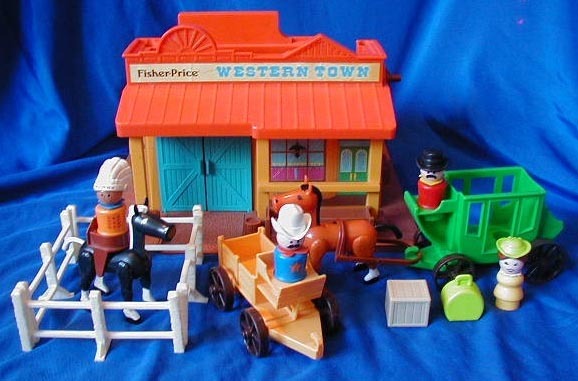 Like all the best of the Little People toys, the Western Town lasted just two years before being discontinued, although a 3-pack of Western people (#676) designed to be accessories for it began production the year that the #934 ended. That makes sence. The cowboy and indian figures, although colored differently, were sold until 1990 in the #676. 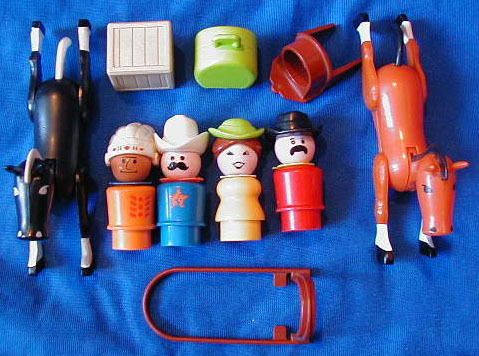 The dainty western lady who was sold with the Western set was totally disconinued with the western set in 1984. B934WITH - Western Town Base - Yellow Western Town building with a red roof and a brown plastic base. A hand crank on the side of the building activates a moving walkway on the roof. 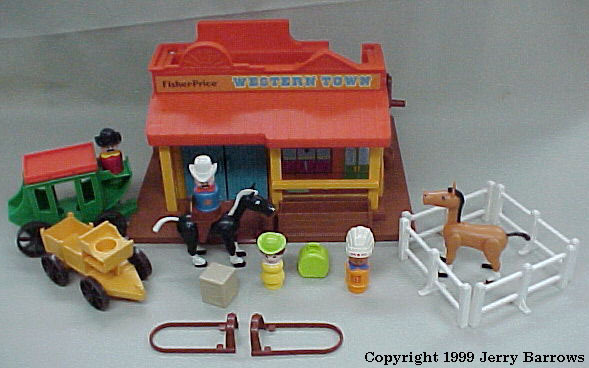 The front of the building has a molded-in water trough, a yellow horse tie post, and a paper litho on the roof marked "Fisher-Price WESTERN TOWN". The front and the back have 2 blue wood-simulated doors that open and closed. The sides of the building are covered with paper lithos with western designs. FPT486 - Yellow 1-seat buckboard wagon with a rectangular area behind the seat to place accessories. The buckboard rolls on 4 brown spoked wagon wheels. FPT487 - Green stagecoach with a seat raised high on the front for the stagecoach driver, and 2 passenger seats within the stagecoach. The sides of the stagecoach have 2 small open windows and an open doorway. There is an area in the back of the stagecoach to place accessory luggage. The color of the stagecoach should always be opposite of the color of the buckwagon described above. FPT489 - Red rectangular roof that fits on top of the stagecoach described above. FPT237 - 4 each - White plastic farmyard style fence section with an old style "KNIFE-WHITTLED" finish. The fence has two horizontal beams set across three vertical upright posts. 2 each - FPT906 - 2 each - Brown horse harness. The harness has straight side beams that form a long rounded U-shape to fit on the sides of a horse with the rounded part of the U-shape behind the horse' tail. The long ends of the U-shape are connected with a small U-shape that fits over a horse's back. The rounded part of the U-shape connects to the hook on front of the buckboard or stagecoach sold with the #934 Playset. Measures 3-3/8" long, 1-3/8" wide, 1-1/8" tall. FPT909 - Brown traditional western style saddle that holds one Original Little People figure. The saddle has a round seat hole on the top and 2 long groundward pointing "stirrup" pieces on the bottom sides. The saddle fits on a horse back. UQ - Light brown horse with black eyes with eyelashes, a black mane, black tail, white socks, and black hooves..
XL - Shiny Black horse with white eyes with eyelashes, a white mane, white tail, white socks, and black hooves. XPP - Blue sheriff with a moustache, an orange star on his chest, a tall white 10-gallon cowboy hat, and an orange scarf. *See Variations below. DSPP - Red man with a thick downward curved moustache, a black felt hat, and a yellow scarf. DAPP - Orange Native American Chief wearing a white war bonnet and a blue non-triangular scarf. The front of the war bonnet has red heat-stamped markings. He also has a red heat-stamped breastplate on his chest. *See Variations below. HFPP - Yellow lady with fancy eyes, brown hair in a western bun, wearing a lime green fancy hat and a white scalloped collar. B934WO - Western Town base without the attached F934 roof flap. F934 - Flat red plastic flap used as part of the roof on the #934 Western Town Blue. One side of the flap has a raised line "ribbed" design with 8 lines. The top edge of the flap has 2 squared holes with a pole within each square. The poles snap onto clamps on the B934WO Western Town Base. This design allows the flap to lay flat to be used as a roof, or lift up to play inside the Western Town. 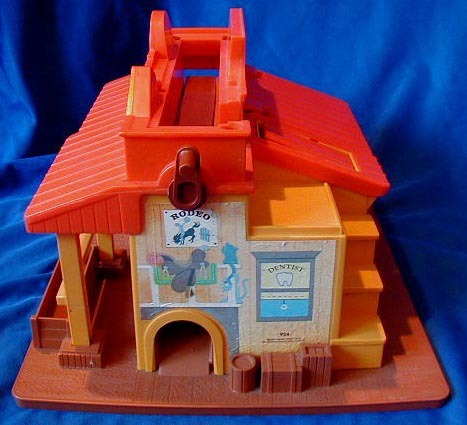 *Note: This flap will fit on the #937 Sesame Street Clubhouse base, but it is not the correct piece for the #937. FPT487 - Green stagecoach with a seat raised high on the front for the stagecoach driver, and 2 passenger seats within the stagecoach. The sides of the stagecoach have 2 small open windows and an open doorway. There is an area in the back of the stagecoach to place accessory luggage. FPT488 - Yellow stagecoach with a seat raised high on the front for the stagecoach driver, and 2 passenger seats within the stagecoach. The sides of the stagecoach have 2 small open windows and an open doorway. There is an area in the back of the stagecoach to place accessory luggage. FPT485 - Green 1-seat buckboard wagon with a rectangular area behind the seat to place accessories. The buckboard rolls on 4 brown spoked wagon wheels. KUPP - The sheriff could also have a silver star opposed to orange, but the silver star version is far more hard to find. JUPP - The Native American Chief could also have silver markings on the side of his warbonnet, but like the sherrif with a silver star, these are hard to find. CZPP - The native American Chief could also have red markings on the front of his war bonnet, but no breastplate. FP934SET1982 - (Complete Set) Complete set with original 16-1/8" long, 11-1/8" high, 8-1/4" deep box.